Get ready for LOUD! Get ready for SPEED! Get ready for spectacular precision flying by the BLUE ANGELS! Headlining the 61st Annual Chicago Air and Water Show will be the US Navy precision flying team the Blue Angels. This year's air show boasts a huge line-up of civilian and military aircraft. This is the biggest event on the lake each year. Sail with us and be a part of it. We are offering two options for Saturday and Sunday during the show. This is the ultimate Chicago Air and Water Show watching package. We'll have our Catalina 36 sailboat, Bernard, ready and waiting for you at 9:00 AM. Bernard and its captain will be at your disposal until the scheduled return time of 5:00 PM. For those eight hours, we will tailor the sailing experience to suit your preferences. Anchor, swim, sail, it's your choice. You pick the guest list, choose the music, bring your favorite beverages & snacks, and we'll take care of the rest. Kickback and enjoy the show. Want to throw some shrimp on the barbie or flip some burgers? We'll be happy to setup the gas grill. Want to take a break out of the sun? Just ask and we'll setup the large bimini cover for some shade from the sun. We'll be sure to have the refrigerator stocked with ice and bottled water. And, yes, there is a restroom on board. 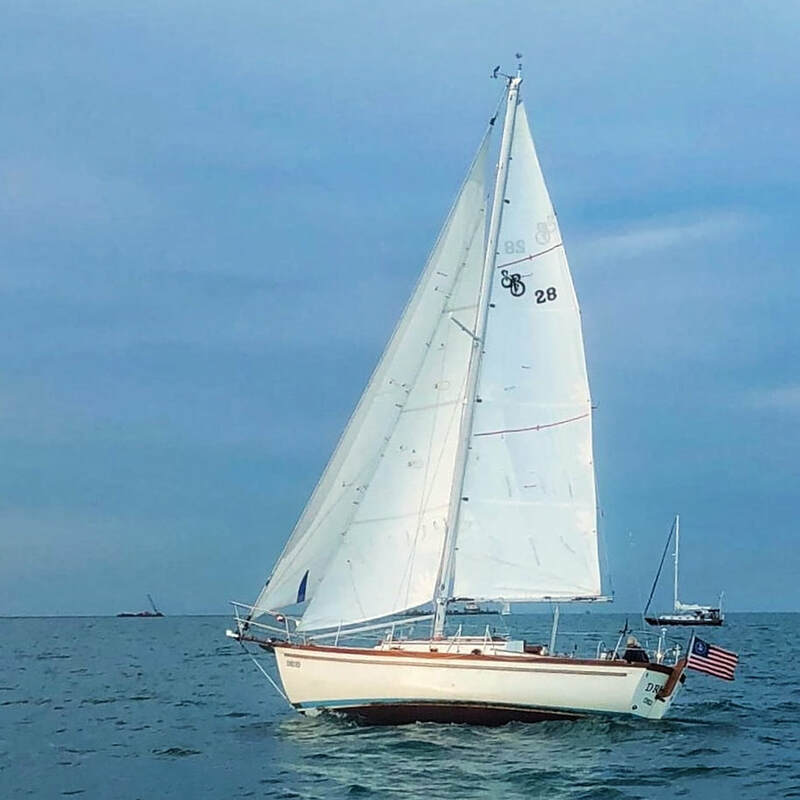 A thrilling two-hour sailing charter on board our Shannon 28 sailboat, Druid, is a perfect choice to enjoy sailing along Chicago's beautiful lakefront with the added bonus of seeing some really amazing aircraft along the way. To a certain extent, this charter is like a shortened version of Option #1. We will still tailor the charter to suit your preferences. And, you sill pick the guest list, choose the music, bring your favorite beverages & snacks. This charter is for sailors since we just won't have enough time for some of the other activities available on the All Day Charter. To book this option, just select an available time slot for s/v Druid on Saturday the 17th or Sunday the 18th. The Blue Angels are expected to perform last each day. Booking for these shows is available now. Keep in mind when booking that it can take an hour to get to and from the the "show box". While we will see planes everywhere, the area around the show box is where the best viewing will be and where you will see hundreds of boats anchored to watch the show. 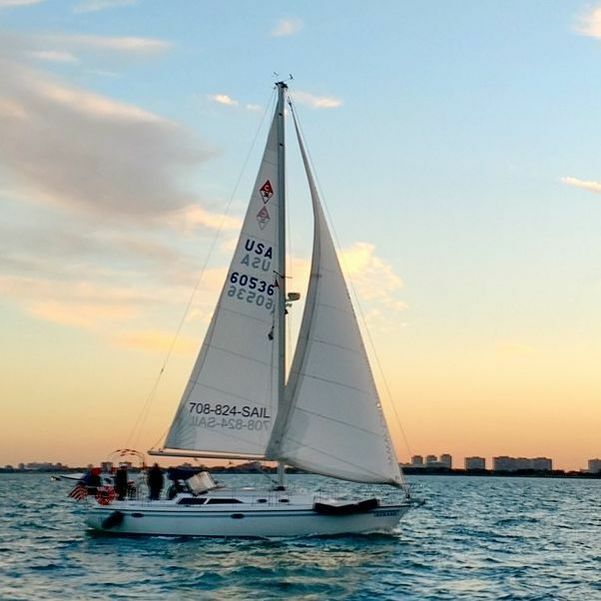 ​​Come Sailing is Chicago's premier private sailing charter offering a variety of private charter experiences on Lake Michigan. Your Chicago sailing adventure starts here! Learn more about the US Navy Blue Angels. ​All charters are private. The passenger list is at your discretion. * Standard charter duration is 2 hours. ​Call us if you would like to extend your time on the water. A 15% minimum gratuity for the captain/crew will be added to the price of charters 6 hours or longer in duration.